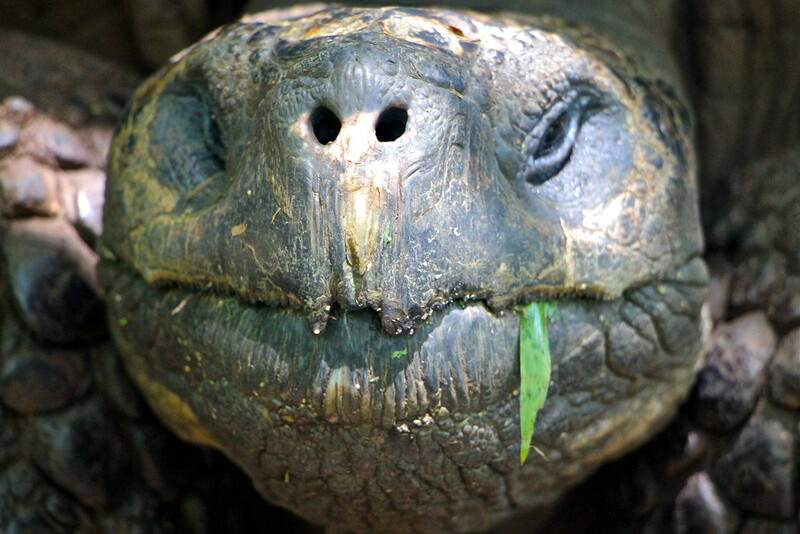 When Spanish explorers first discovered an archipelago of islands off the coast of modern day Ecuador, they were so astounded by the giant tortoises there, they named the entire island chain after the Spanish word for tortoise, Galapago. It would be remiss of us, therefore, not to see these magnificent creatures for ourselves on our visit to the Galapagos! Making our way up a dusty narrow road, we left behind the blue waters surrounding Santa Cruz island and headed inland. Our trusty Galapagos guide and driver were taking extra care as we approached the giant tortoises natural habitat. Suddenly our car slowed, and in front of us what seemed like a large boulder lay half on the road, half in the bushes. 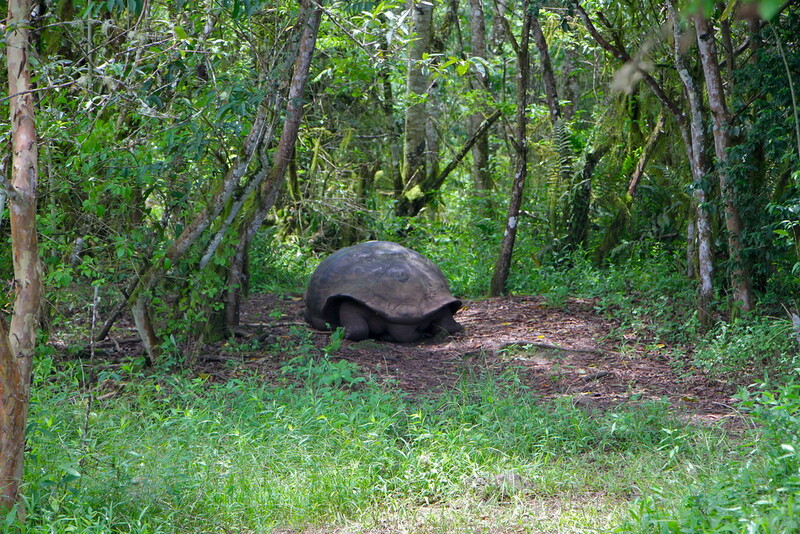 Our first glimpse of a wild giant Galapagos tortoise! Out of the bottom of the mammoth shell, a small head on the end of a long neck stretched out from underneath to identify the noise interrupting his day. After a minute analysing the situation, our new hero in a half shell tucked his head back into his shell. He certainly wasn’t planning on moving anytime soon! Seemingly experienced with this approach from the giant tortoises, our driver checked the other bushy side of the road was clear, hitched up onto the other side of the dirt road and we continued on our way. 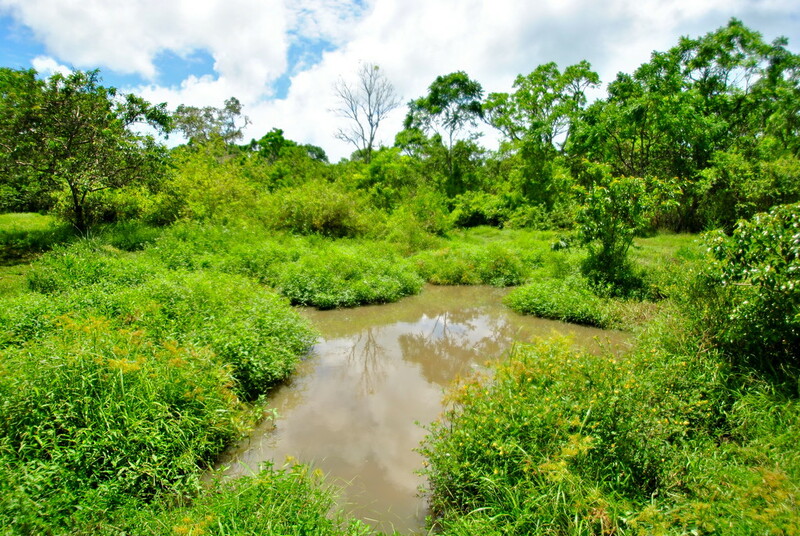 Finally arriving at our destination, we made our way through the lush green forest excited to encounter more wild giant tortoises. After only a few minutes, we rounded a corner and bumped into this tortoise in search of some shade (and perhaps a nap). We watched him as he ambled towards the undergrowth, his thick strong legs heaving the weight of his shell towards the nearest bush. 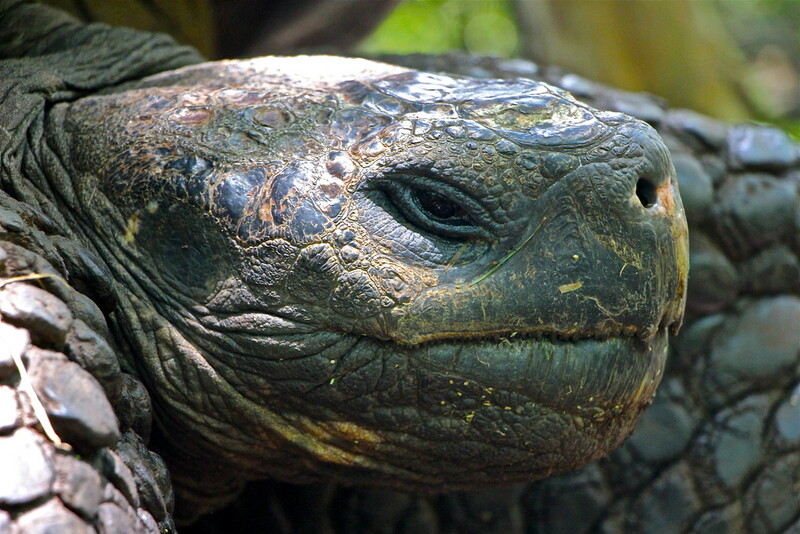 Now in search for a larger, older tortoise, we made our further into the rich forest nearby. And then, in the bushes nearby, she spotted a mature giant tortoise! 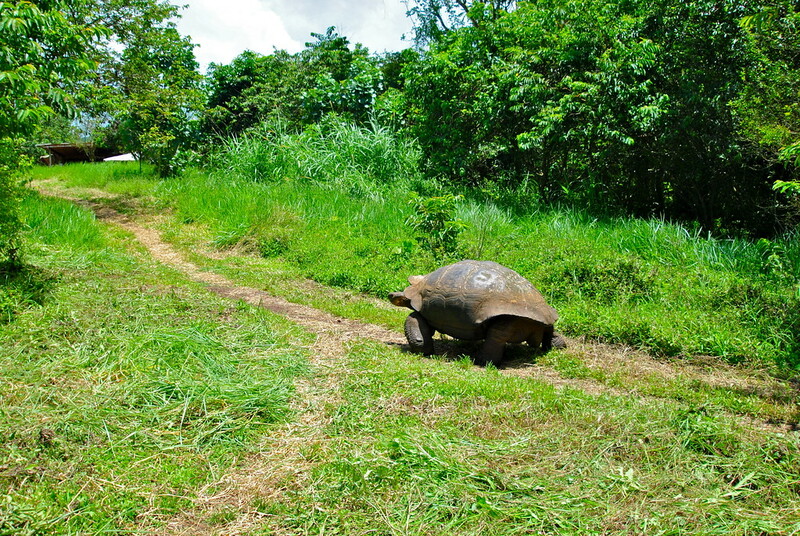 Our guide approached slowly and quietly to avoid surprising the tortoise, and we followed behind. In hushed tones our guide enlightened us about this giant tortoise, as he sat and munched through his lunch, disinterested in his newly found audience. We sat for a few minutes in awe of the creature, and observed their behaviour from close quarters. Obviously they walk slowly, but we learned everything they do is done in slow motion, with an assured purpose to each and every movement. A glance to the left takes a few seconds to make, they will fix their stare on you for minutes at a time, before slowly sweeping their head back whence it came from. They remain stone like in their demeanor, and barely make a noise, although if they are startled or annoyed we are told they can let out a strong cry to ward off unwelcome visitors. But most of the time we spent with them, they were docile, gentle, quiet creatures sat in almost eternal contemplation. 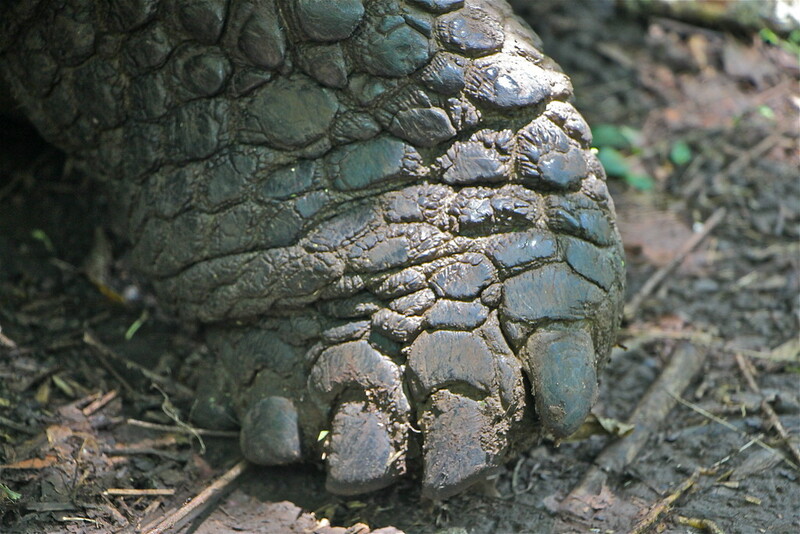 Everything about their bodies was fascinating, from the huge smooth, polished shells they call home, to the cracked, rugged texture of their legs and feet. Even their nostrils and mouth were interesting to us! We were absolutely captivated by the wild giant tortoises of Santa Cruz, and we wished we could have sat and admired them for longer. 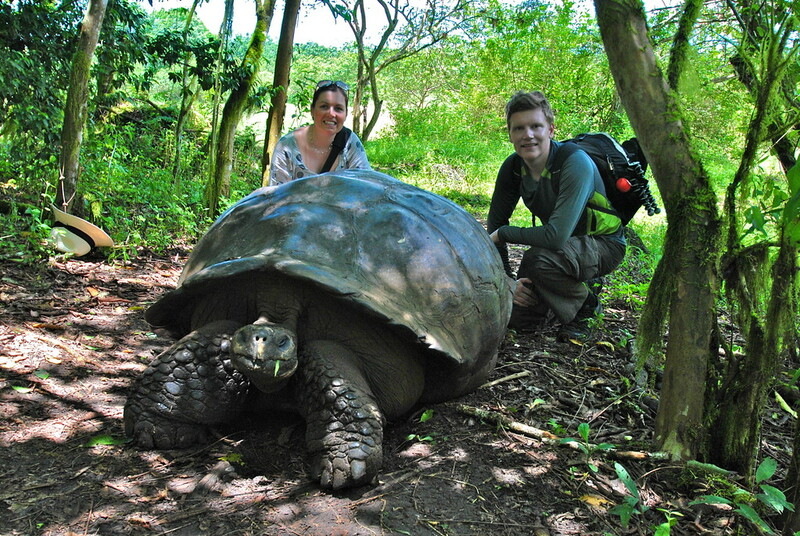 Santa Cruz island is an incredible place to see wild giant tortoises, a must if you make a trip to the Galapagos Islands! Looking for more Ecuador inspiration? Click here.